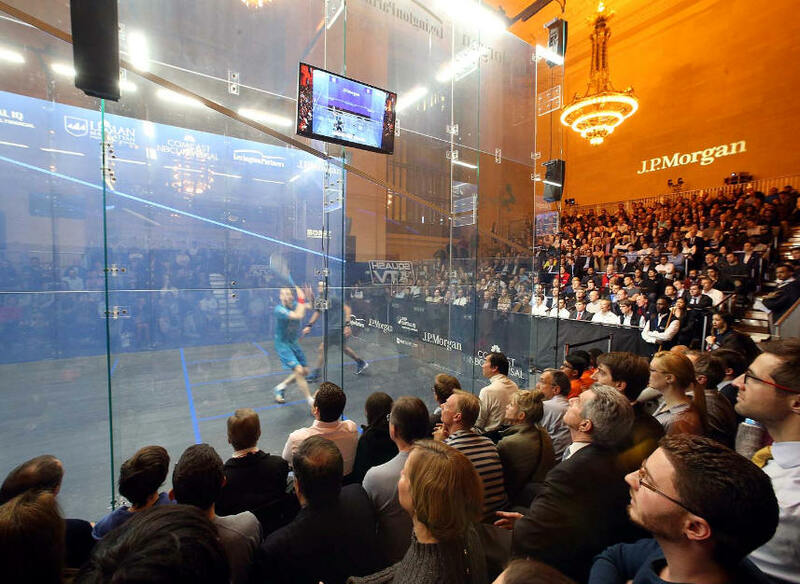 Seventh seed Nour El Sherbini ended the magic carpet ride that had been Amanda Sobhy’s journey through the J.P. Morgan Tournament of Champions, but not before these two newly minted stars of women’s squash threw down the gauntlet on the glittering glass court in front of a sold out crowd in Grand Central Terminal’s vaunted Vanderbilt Hall. 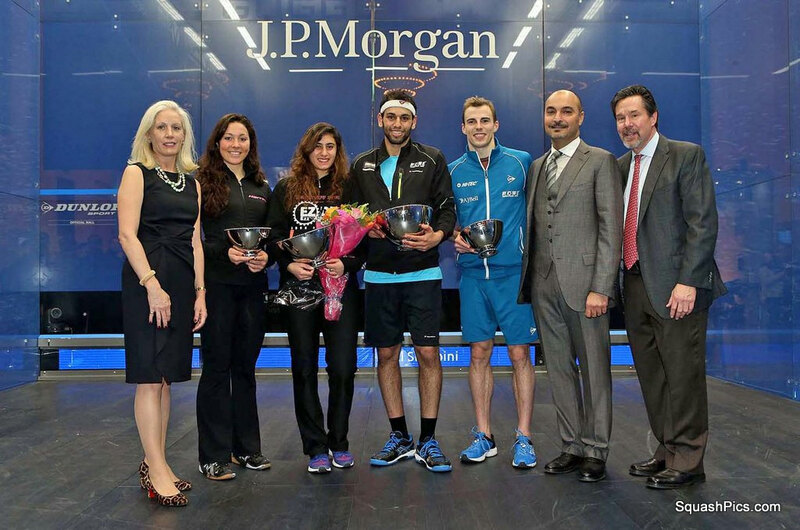 “Nour came out firing from the very start,” said Sobhy, the hometown favorite. who fell behind in the first game early on and never caught up. The second was nip and tuck all the way through with the lead exchanging hands every few points until Sobhy evened the match by winning the game 11-9. 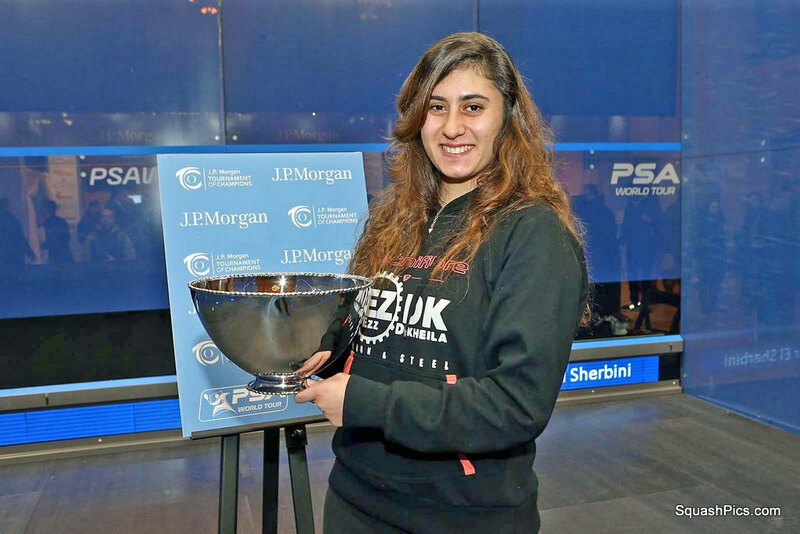 In the third, El Sherbini once again raced out to an early lead, scoring the first five points and then taking an 8-4 lead. Just as she had done all week, the American stepped up to quicken her attack, and hitting the ball to better length in the back of the court, evened the score at eight all. At that point, it was anybody’s game. 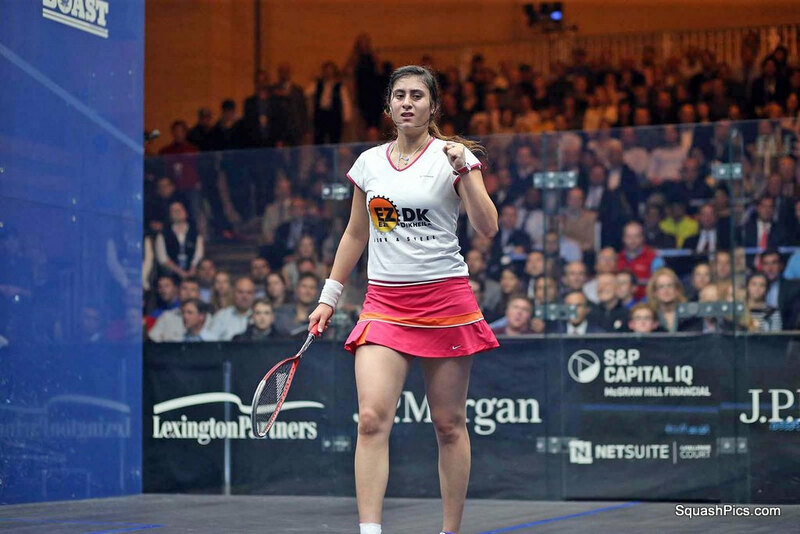 A tinned boast at 10 all by Sobhy gave her Egyptian opponent the lead which El Sherbini converted to a game win on the very next point. 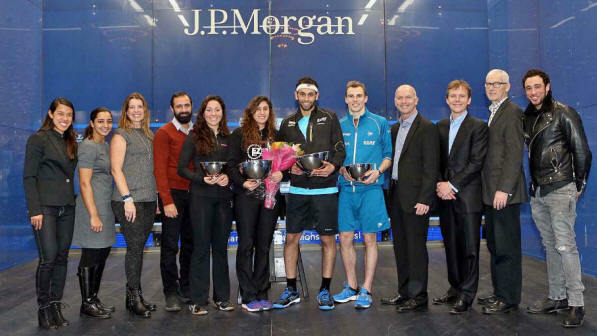 A nerveless El Sherbini, coached by three time ToC champion Amr Shabana, again shot out to a commanding lead at 6-1 and then 8-4 in the fourth. 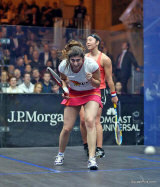 Sobhy, whose competitive will is one of her great strengths, fought back to 7-8. 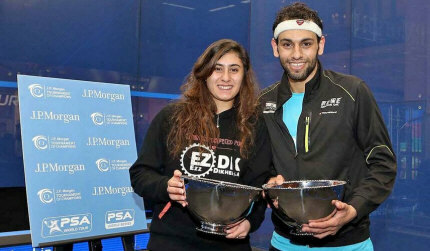 Her 20-year-old opponent was unfazed and allowed Sobhy just one more point before laying claim to one of the sport’s most prestigious titles. 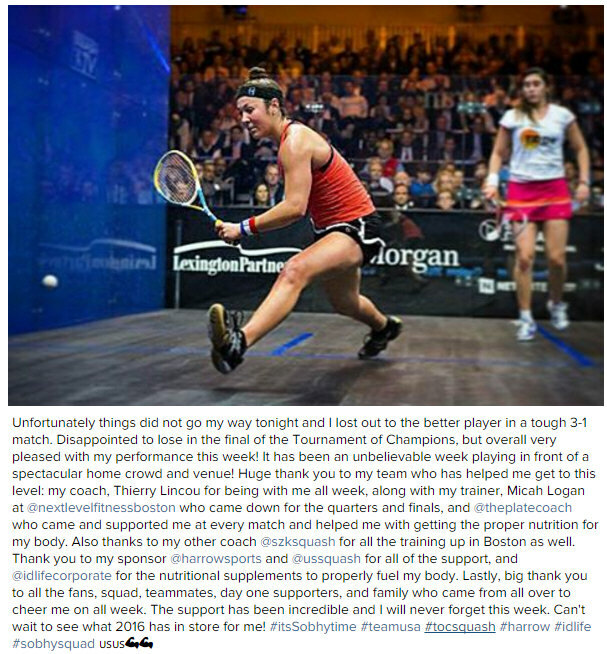 Immediately after winning the biggest title of her career to date, the youngest-ever ToC champion whose steely court composure belies her years, was charmingly at a loss for words when asked how she felt. “I don’t know what to say. 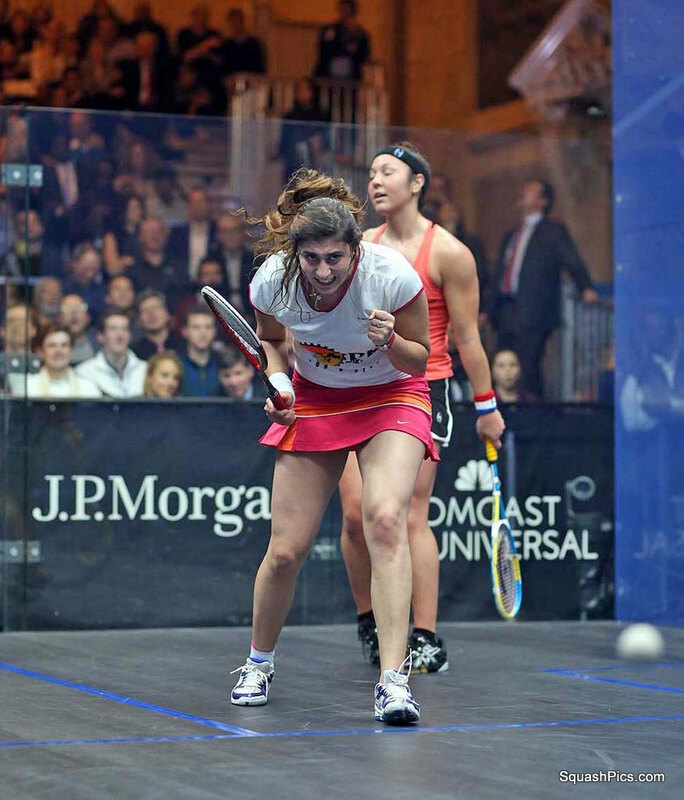 It’s weird and amazing and incredible,” said El Sherbini with a huge smile. "It’s an unbelievable feeling, I can’t express it, words can’t describe how I’m feeling now. This one is really special and to win it is something that I’m never going to forget. I’m really glad that I won this year, I’m really happy." Amazing and incredible could also describe the men’s championship match that followed between defending champion and world no. 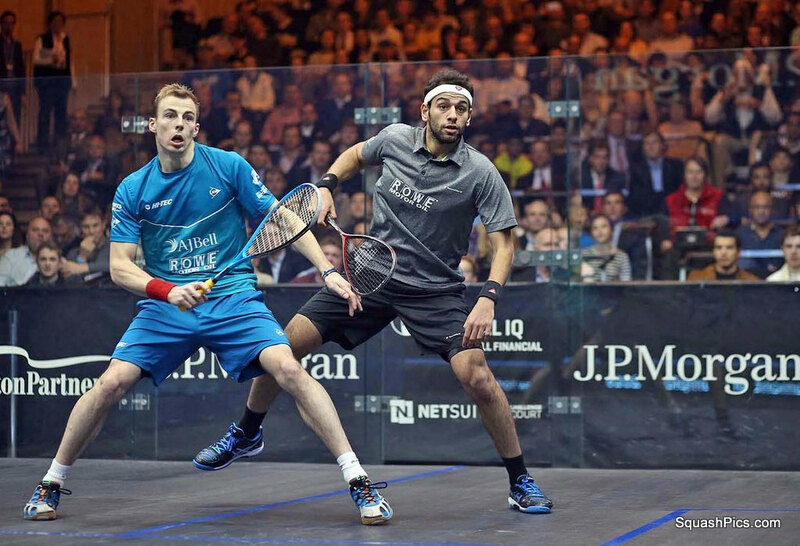 1 Mohamed ElShorbagy and three-time world champion Nick Matthew. 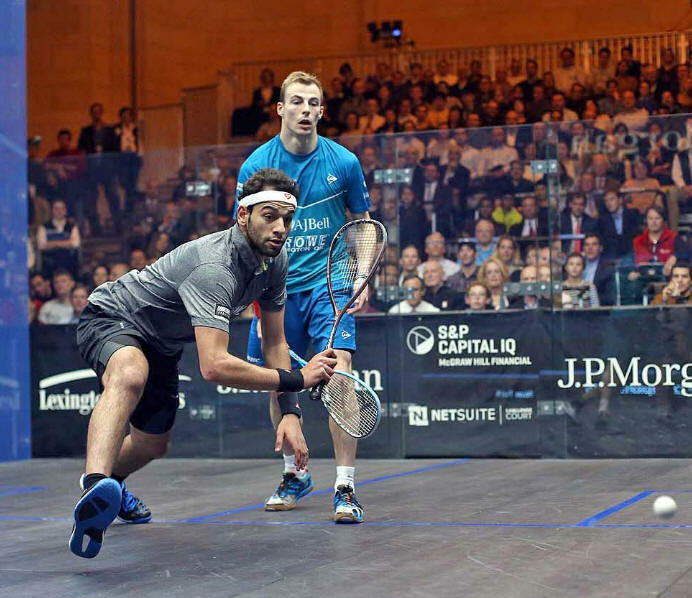 Theirs is a compelling rivalry and coming into the ToC finals, the Egyptian had a slight edge – 8-7 – in career match wins against the Englishman. 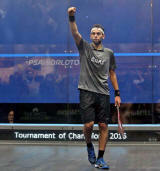 The two strongest- willed competitors on the PSA Men’s World Tour did not disappoint the standing room only crowd as they battled for 91 minutes to earn the right to hoist the ToC trophy..
Matthew, at 35 the oldest player on tour, was still on the comeback trail after a surprise knee surgery in June that took him out of commission for six weeks during the important summer training season. 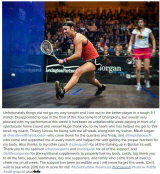 ”My goal for this week was primarily to prove that I am still a contender,” Matthew said. 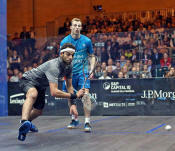 The proof was on the court as he struck first to win the opening game 11-8. 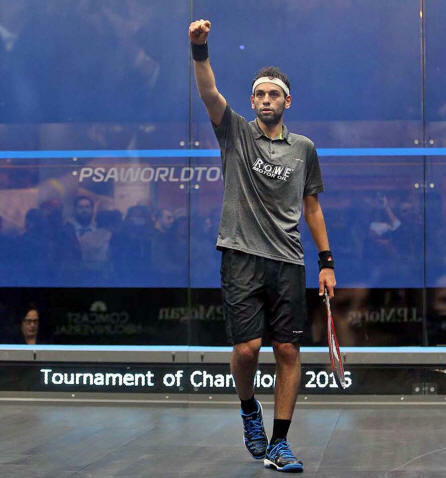 ElShorbagy, who had briefly lost his hunger for the game this past fall after experiencing the sustained pressure of being the top ranked player for a year, had returned to the ToC with his passion restored and it was on full display in the second game as ElShorbagy took command to win it 11-6. 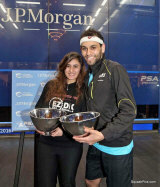 The third was anybody’s game with the lead exchanging hands several times until ElShorbagy closed it out at 11-8. Matthew roared back in the fourth, taking a 7-3 lead and winning the game 11-6. 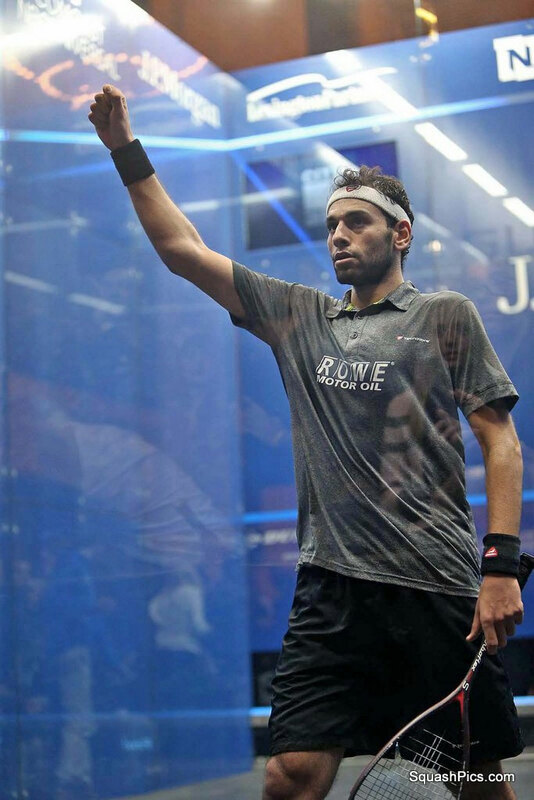 Matthew took a quick early lead at 2-1 and 4-1 in the deciding game, but ElShorbagy was not to be denied as he stormed back and out to a 6-4 and then went up 10-5 before claiming his second ToC crown with an 11-6 fifth game victory. The just-turned-25 year old added, “But I knew that I had to beat Nick tonight. 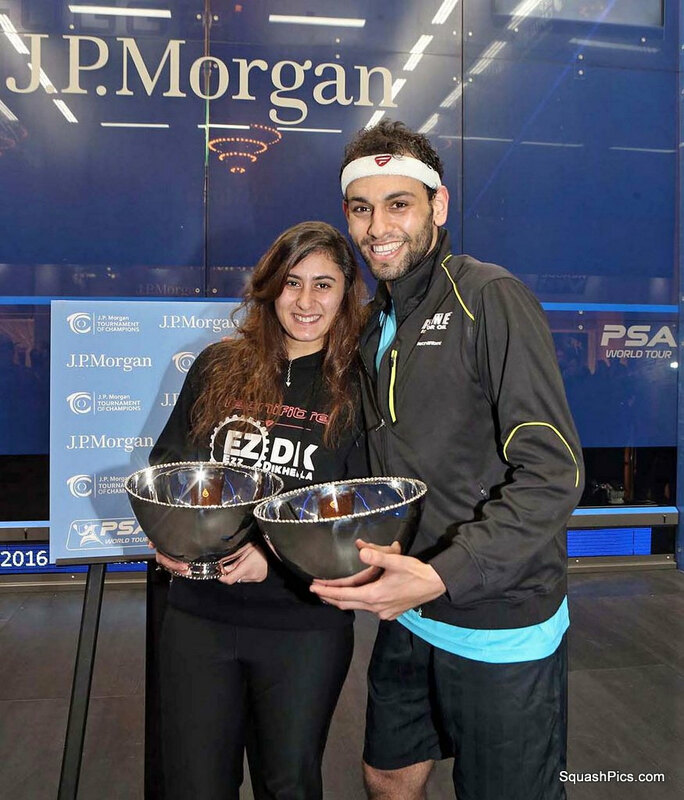 He had already beaten my brother Marwan and I didn’t want him to beat both of us in the same tournament." "Nick and myself always have such great battles. I told him after the match that it’s always an honour to play him in a World Series final and I was really happy to get my second title here. "I really enjoyed the match today and I look forward to having more great battles with him in the future. 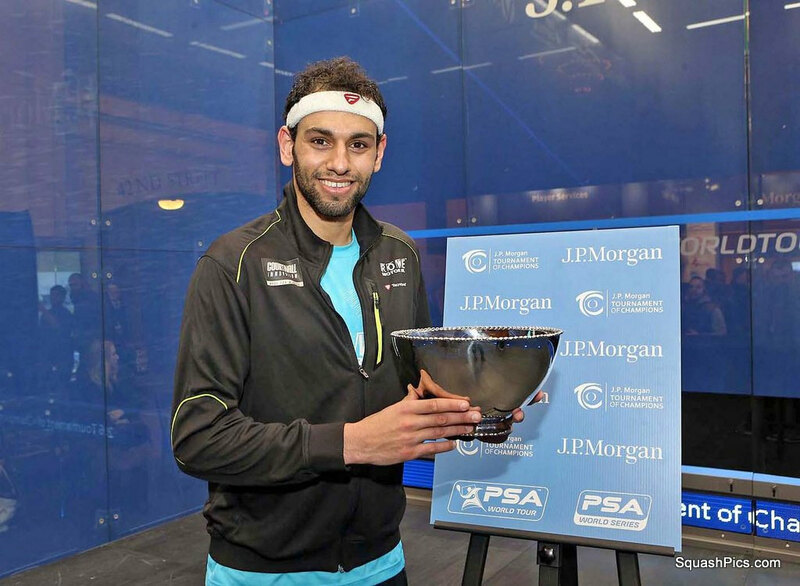 It’s a great start for me to 2016 and I’m glad," concluded Elshorbagy, after winning his third World Series title in three months and strengthening his lead at the top of the World Series standings.